Jeb Halker hangs drywall in a home damaged by Hurricane Harvey in Houston, Texas. COLUMBUS GROVE — Eager to answer God’s calling, Dave Halker, of Halker Drywall Inc., and seven other community members recently traveled to Houston, Texas, to help renovate homes damaged by Hurricane Harvey. 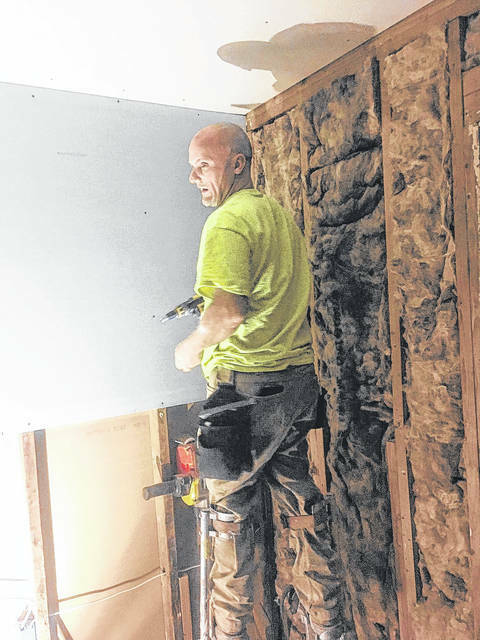 Every year Halker and crew of local electricians, painters and drywallers renovate homes that are damaged by natural disasters like hurricanes. This year they partnered with Lakewood Church, which supplied the materials for them to renovate three out of the 200 homes that needed to be renovated. Two of the properties were owned by single mothers who did not have the funds to the fix the damages on their own. During the seven-day trip in February, Halker, Herron, Jeff Painter, Don Beckman, Scott Watkins, Jeb Halker, Kirby Halker and Austin Mayer, hung drywall, fitted new doors, painted and trimmed. They finished the estimated three-week job in only a week. Herron said that it is a pleasure to help those in need because he knows that when there are natural disasters in which the Federal Emergency Management Agency is not always able to help everyone in need. Herron believes that more people should get involved and be a gift from God to those in need.